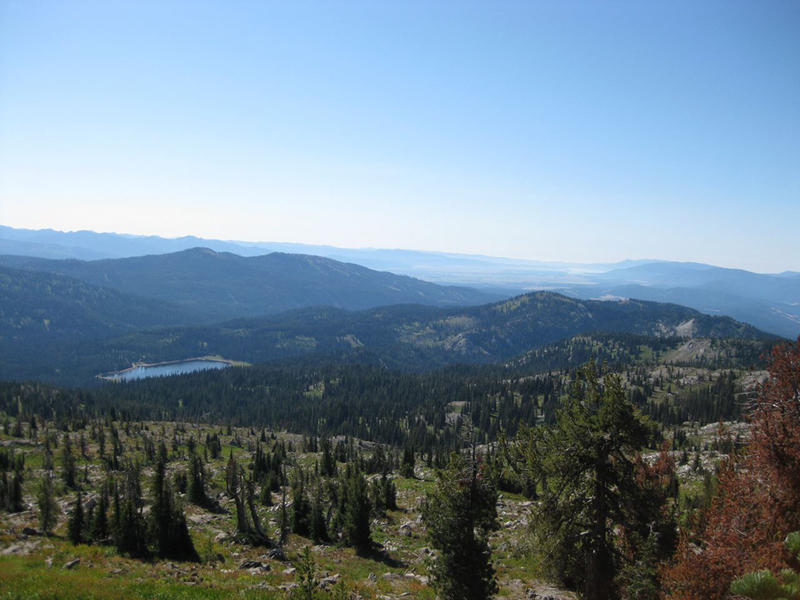 A beautifly weekend in McCall with hikes to Golden Lake and Granite Mountain. 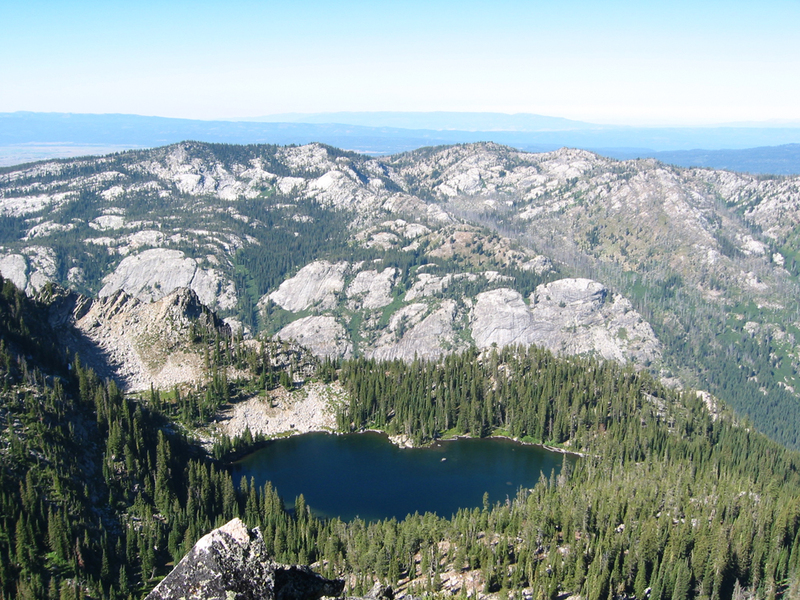 As a sort of family tradition, Dad and I have hiked to Golden Lake on or about June 1 for years. Some years you can drive all the way to the trailhead, others we've had to walk an extra 1/2 mile or so due to snow. This year the snow was so deep we couldn't even get close. Here it was the end of August and we still hadn't made it to Golden Lake. So we left the house at about 8 and were walking about 9am. That's Slick Rock in the sun on the other side of the valley. 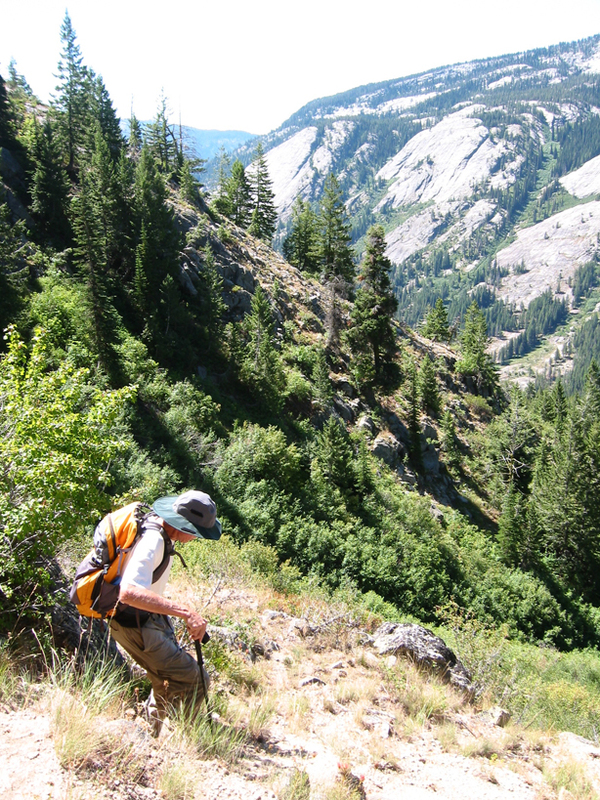 The hike to Golden is on a secret trail. 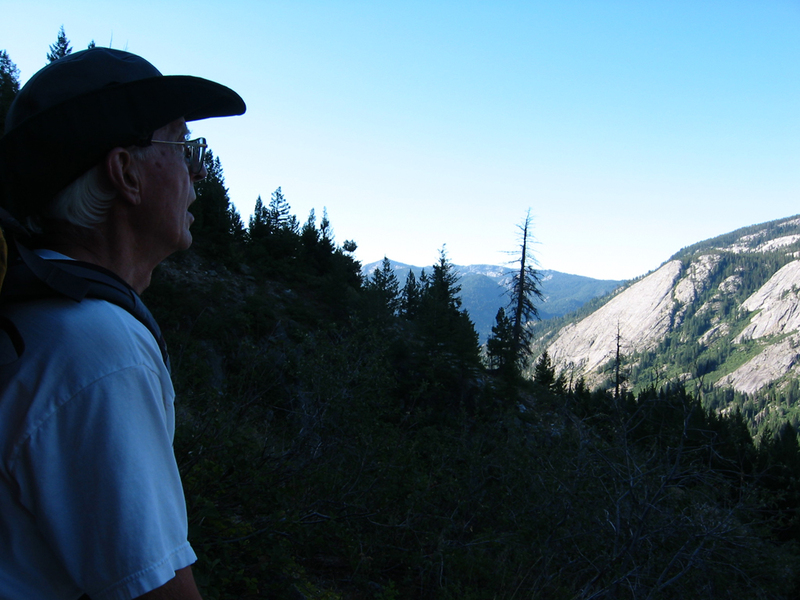 Dad has probably done this hike close to 100 times; it's his favorite. But at 78, he can no longer do the 1700' in under an hour (that wasn't true just a few years ago). 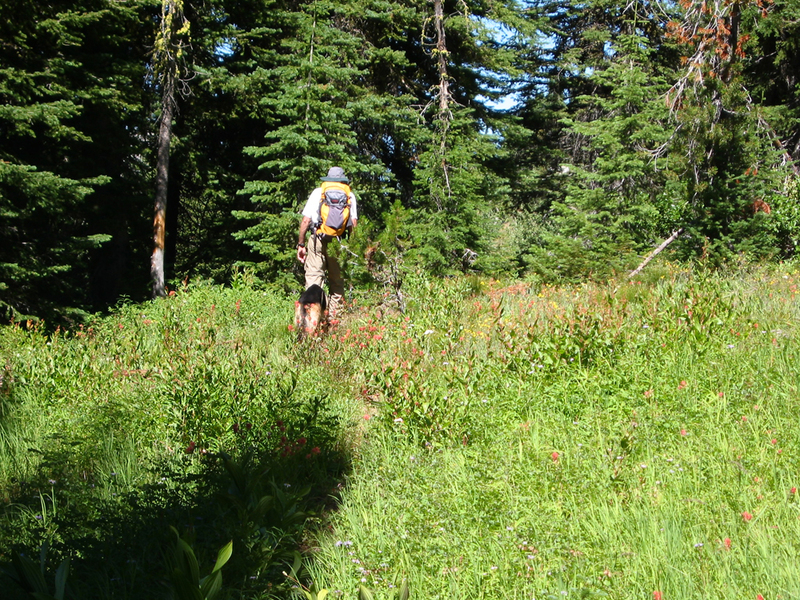 We had a little trouble finding the trail- the wet spring left the undergrowth quite thick. But we made it to the lake, and it was a gorgeous, windless morning. 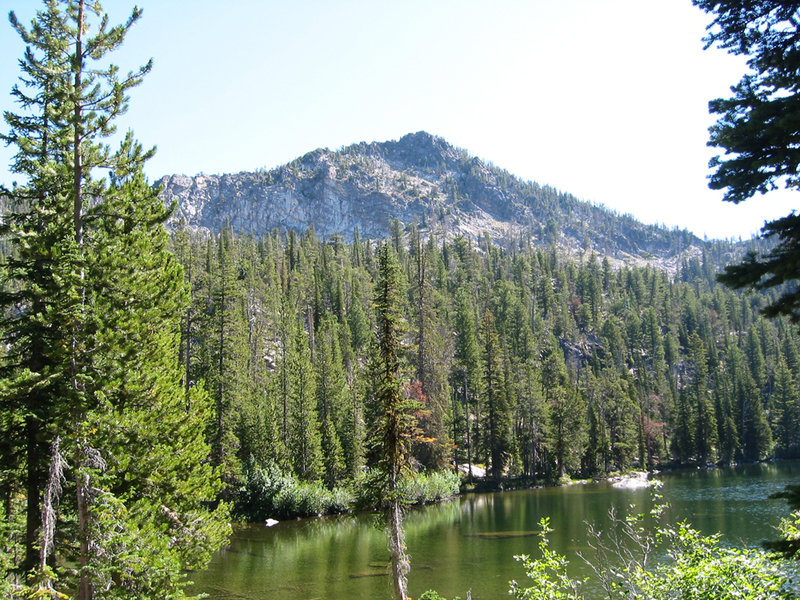 The peak behind the lake is Point 8361, aka Platt Peak, or at least that's what my younger daughter calls it. I had been all the way around it in various pieces of hikes, but never up. So today was the day. I decided to make it more sporting by doing a traverse from left to right. The left ridge was somewhat difficult- I had to move back and forth over the crest as I moved toward the summit, and some sections were Class IV. 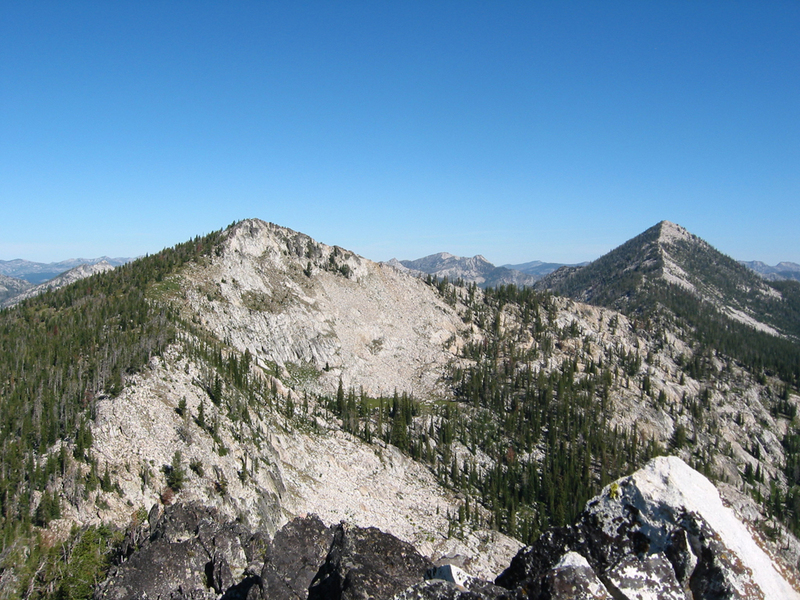 Nice view on top- that's Snowslide Peak on the left, and Sawtooth Peak on the right. And this is the view back down to the lake. Dad and his dog, Dieken, were down there somewhere. He said he could see me on the summit. Then I walked down the opposite ridge, an easy Class III scramble. I got back to the lake for about a 75 minute circle from the lake. Dad and I had lunch, and I went for a swim from the little rocky point in the middle of the far side of the lake. Then we headed back. You see any trail? Dad knew right where it was, even though you couldn't see the ground. The 'trail' is pretty tricky on the way down- it's very steep, with lots of loose gravel and rocks. It also meanders around a bit, so it can be hard to follow. 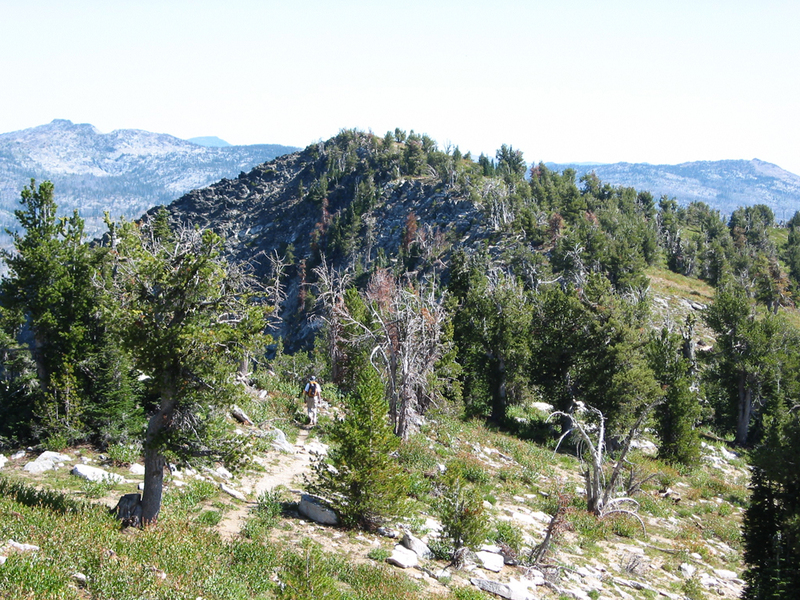 The next morning, Dad's legs felt fine so we headed for Granite Mountain. This time Shelley would join us, as would my friend Art. We did this same hike together in 1998. 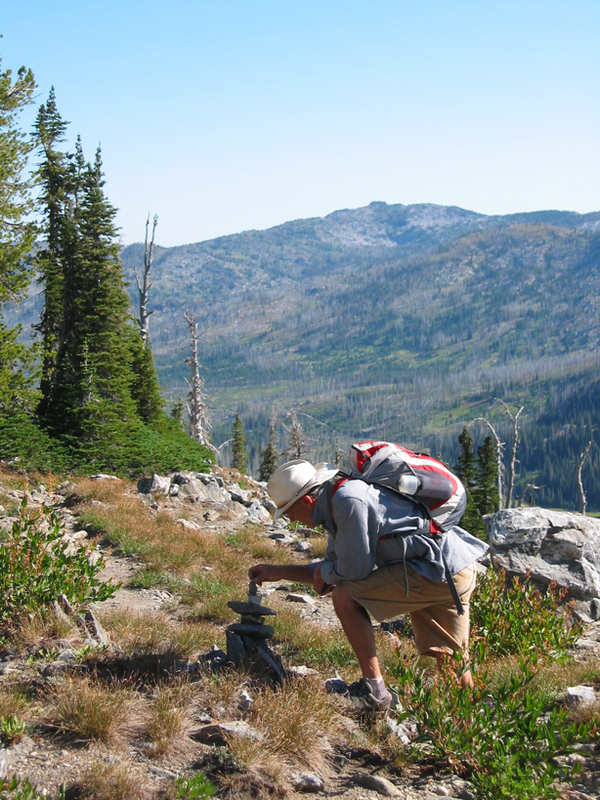 Here Art embelishes one of the many cairns that dot this popular trail. 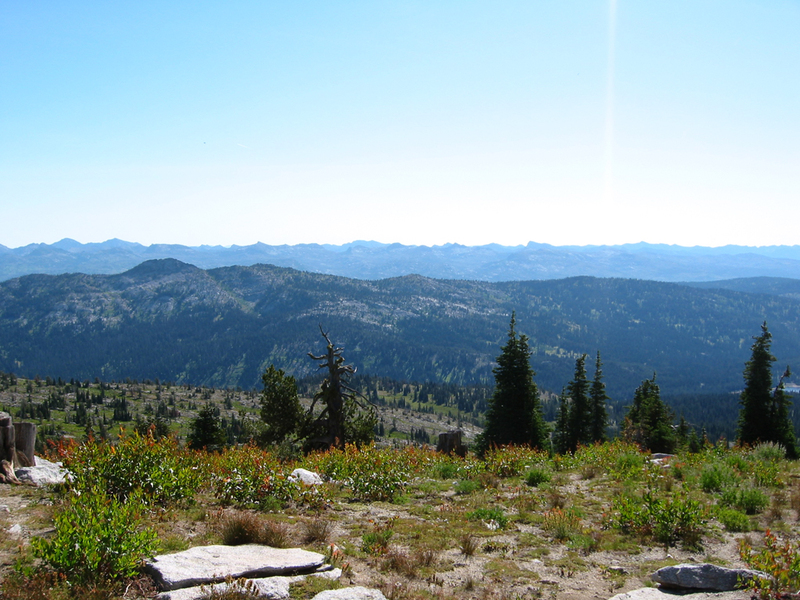 It was another beautiful day, but I didn't take a lof of photos until we hit the summit. Shelley was kind enough to share some of her photos. 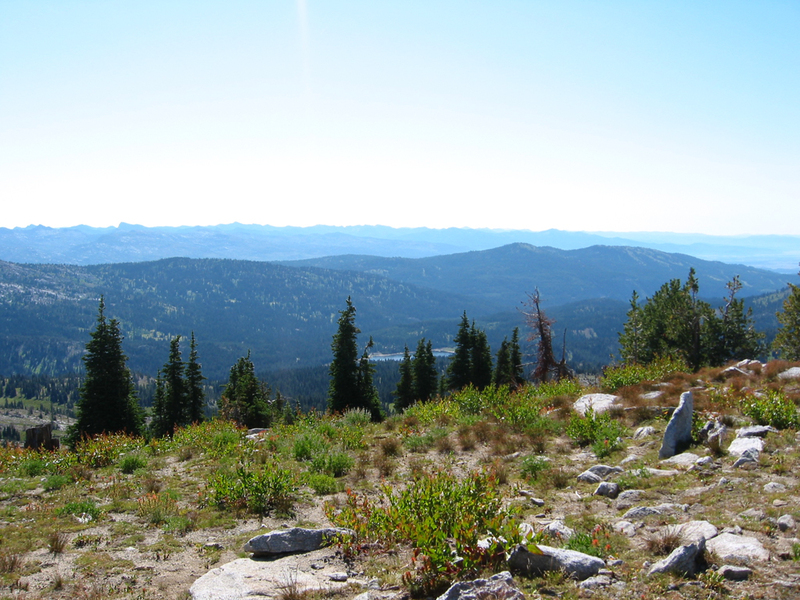 This one is looking back toward McCall, with Cascade Reservoir in the distance. 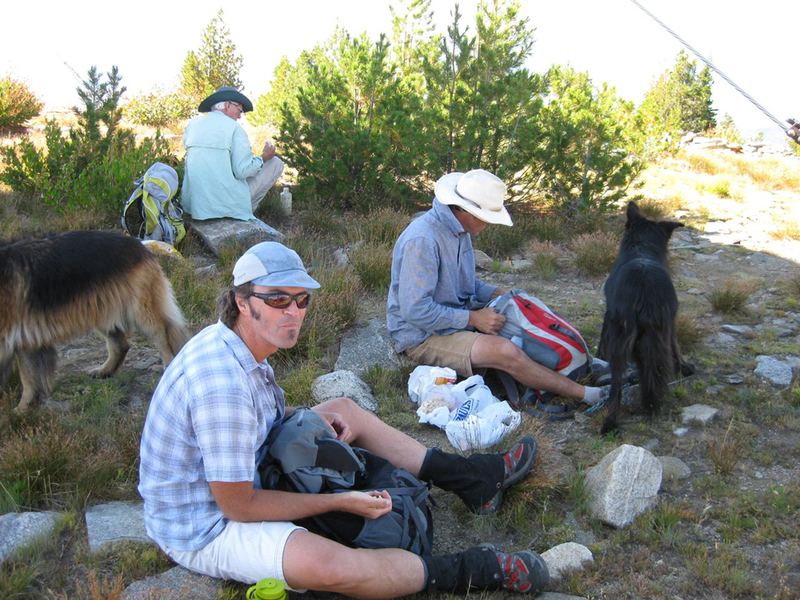 And here we are on the summit in smorgasbord mode. 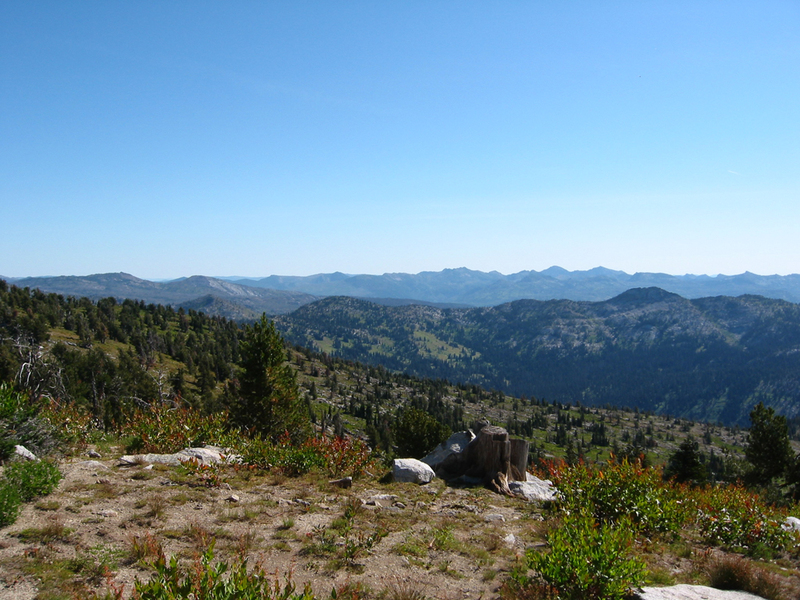 We had a long lunch, chatted with the lookout, and spent a lot of time identifying the many summits visible from the top. This is the first of a panorama lookinig north-east, then moving south. If you ask me, I can tell you the names- we've been up many of them. Then is was time to head down. Dad and Dieken are on the trail (click for a bigger photo). Art and I were feeling spry, so we went ahead. 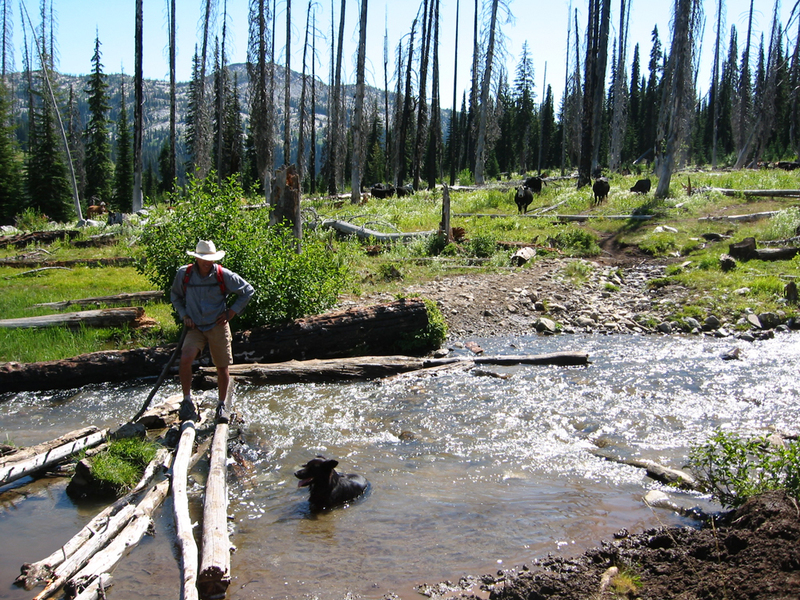 Here his dog Samson "takes a drink" just short of the car at the trailhead. Note the abundant wildlife in the background.